Located on Florida’s east coast, about 100 miles north of Miami, Jonathan Dickinson State Park (www.floridastateparks.org/park/Jonathan-Dickinson) is one of the state’s largest and most diverse state parks. 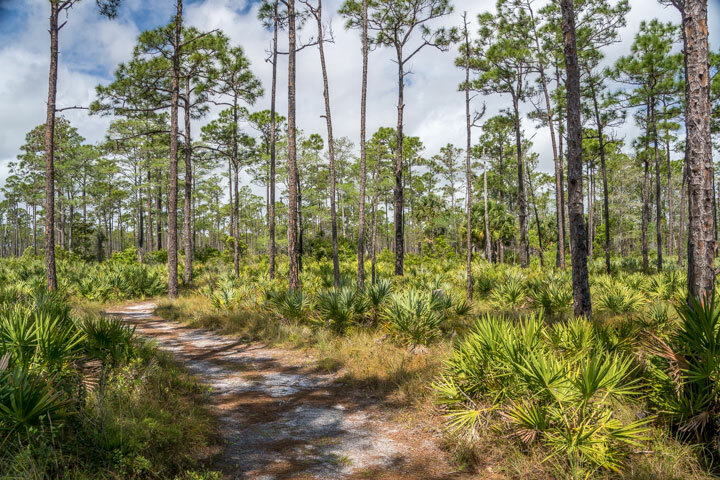 At over 10,500 acres, the park supports 13 different ecosystems and includes a variety of trails. And although none of the trails are rated as wheelchair-accessible, the Kitching Creek Nature Trail is quite doable for most power wheelchair- and scooter-users. This 1.25-mile trail is located near the river area facilities, at the far corner of the third parking lot. Accessible parking is located near the trail, with level access over to the trailhead. 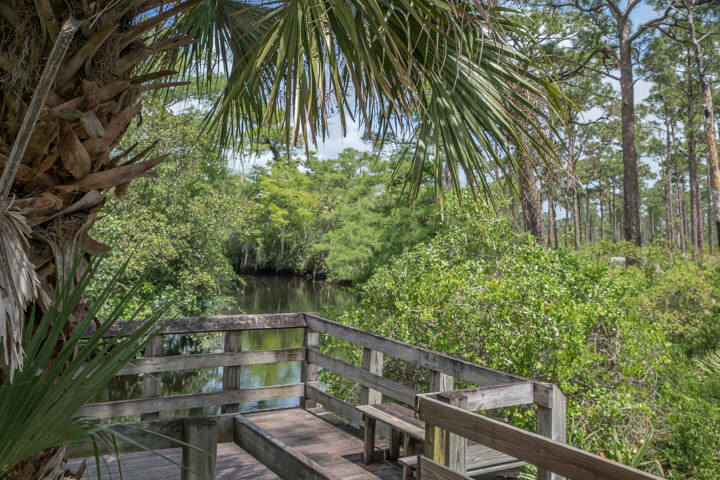 This scenic trail travels along Wilson Creek and through pine flatwoods to an overlook on Kitching Creek. The trail begins with a hard-packed dirt surface, and the first stretch is fairly accessible. There’s a small lip on the bridge that crosses Wilson Creek, and after that there are patches of sand and a few tree roots along the trail. Still, most of the obstacles are pretty easy to dodge. There’s a one-inch lip up to the shaded overlook at Kitching Creek, and after that the palmetto-lined trail transitions back to a hard-packed dirt surface. Finally, the trail continues on through some grassy areas, crosses back over Wilson Creek, and leads out to the parking lot. Alternatively, there’s a shorter loop of the trail that may work for most people. Just make a left turn after you cross the first bridge on Wilson Creek, and follow the trail alongside the water. At the next bridge, cross back over the river, and complete the loop back out to the parking lot. Give it a try, as you can always turn back if the access doesn’t work for you. It should also be noted that wild hogs like this habitat, so you may find some holes — and some wildlife — along the trail. That said it’s still worth a try as it’s a nice ramble through the woods.